GR 2 Aínsa: a town between two rivers. 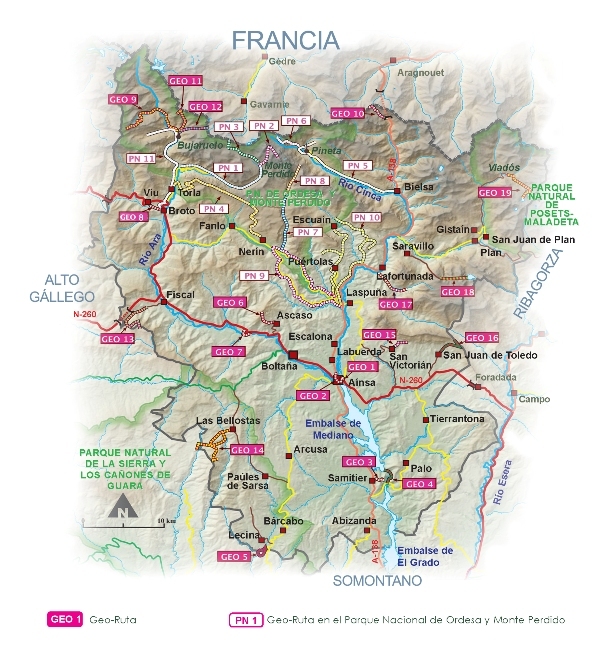 Indeed, the Geo-Route network of the Sobrarbe-Pirineos. Geopark was created to learn about and understand its geological heritage in greater depth. This is a network of 30 self-guided routes that allow visitors to access the most outstanding geological sites in the district and understand their origin, meaning and significance. All Geo-Route have been designed so that they can be covered on foot and are clearly signposted; in most cases they are based on official short-route (PR) or long-route (GR)except PN 1, PN 4, PN 5, PN 9, PN 10 and PN 11 that combine a stretch of road and vehicle with trails paths. There is a brochure on each route in order to facilitate the interpretation of each stop on the way. The Geo-Routes PN are taken from the Geological Guide Ordesa and Monte Perdido National Park" from the Collection of Geological guides of the National Parks (IGME-OAPN, Roberto Rodríguez Fernández dir. and coord.). Taken together, these routes will enable visitors to enjoy the most beautiful parts of the Sobrarbe district and also obtain further information on its long geological history dating back over 500 million years.